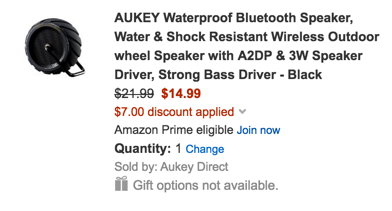 Aukey via Amazon is offering its Waterproof Bluetooth speaker for $21.99, but if you use the code 4CTKF5EU the price drops to only $14.99 Prime shipped. That’s $7 off the regular sale price and tied with our previous mention from April for the lowest we’ve seen. It has a 3W driver that produces “robust, well-rounded sound to enjoy in the shower, on a hike, or during a picnic under a waterfall.” It also has a 6 hour battery and you can hang the speaker just about anywhere using the metal stand and included strap. Rated 4.2/5 stars by 153 Amazon customers. We still have our Anker deal roundup and Ringke iPhone cases from yesterday. AUKEY Outdoor Bluetooth Speaker Listen to your favourite music, songs and podcast with this rugged Bluetooth speaker from Aukey. Its compact body makes it so easy to bring to your next camping, hiking or adventure trip. Unique design A metal handle bar conveniently let you hang the speaker to your backpack or tent using a carabiner. Weights only 6 oz and smaller than a baseball, it adds little weight to your backpack but provides tones of fun entertainment. Outdoor Design IPX4 waterproof body withstand water splash and occasional drink spill; rubber body gives extra protection against drops and bumps; while silicon cap guards charging and AUX port against water damage. Music without Strings Pair, connect, and playback wirelessly. Compatible with Bluetooth-enabled devices, enjoy audio bliss from your Apple device, Android smartphone or tablet from up to 30 feet (10m) away. AUX Support With a 3.5mm AUX cable included, you can play music from non-Bluetooth devices such as CD player, DVD player, MP3, etc. Wired or wireless, the choice is yours.